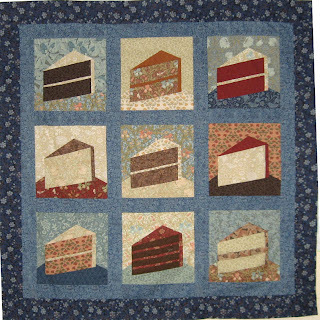 Barbara Brackman's MATERIAL CULTURE: M-m-m-m Cake! Here's a low-calorie cake that we've been making in my sewing group. 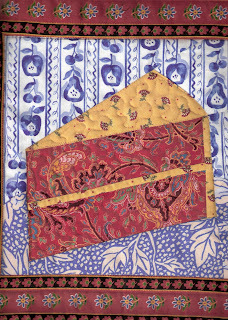 Above one slice of red velvet by Wendy; a cake quilt for Sarah who makes birthday cakes for us all year round and at the top another version by Bobbi Finley, whipped up from The Morris Garden reproduction collection I did for Moda. 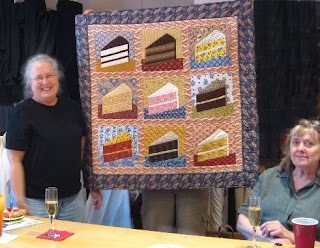 The Morris Garden fabric should be in the quilt shops in July; the pattern for the Birthday Cake is available from C&T Publishing or your local quilt shop. Those look good enough to eat! I'll bet you were waiting for someone to say that! They really are quite lovely. I love all the colors. Looking so forward to the Morris Garden repros come July.